Special Task IDs are only used when Visual LANSA Slave Systems are used with a LANSA for i Master System. You cannot use special task IDs with a Visual LANSA Independent System. Three types of Special Task Id are supported, corresponding with product task tracking, developer task tracking and minimum task. The Special Task IDs setting is performed at system level. The Special Task IDs can be maintained on a LANSA for i Master LANSA System under the Task Tracking System Settings available from the Administration Menu. A unique two letter prefix is required for each type of Special Task Id (that is, for product task tracking, developer task tracking and minimum task tracking). It is recommended that the default prefixes are used. Insert the prefix for product-oriented tasks. It is recommended product-oriented task identifiers use "*T" as the first two characters. If you follow this recommendation, you could, for example, create task identifiers *T00000A and *T00000B for a Product A and Product B. Users need to be authorized to product-oriented tasks as usual. Note: Review this information via Task Tracking Settings, described in the LANSA for i User Guide. Insert the prefix for developer-oriented tasks. It is recommended developer-oriented task identifiers use "*U" as the first two characters. It is strongly suggested that an appropriate naming convention be used to identify tasks with users. If you use the recommended prefix, you could, for example, create task identifiers such as *U000BOB or *U00MARY. It is recommended that only one user is authorized to a developer-oriented task. 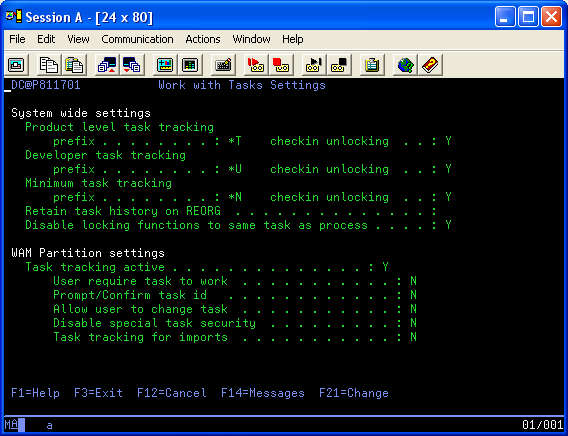 Insert the prefix for Minimum Tracking tasks for the system. The recommended prefix for the single permanent task is "*N". A suggested name for this task, as only one task is required, is "*NONE". All users can use this task and they do not need to be authorized to it. In addition, each type of Special Task Id is associated with a Check-in Unlocking flag. When set to "Y", an object is unlocked from the task both on the IBM i Master and on the Visual LANSA Slave when the object is checked in without the Keep Locks check-in option set in Visual LANSA. At the same time, it is changed to read-only on the Visual LANSA Slave. To change an object again on the workstation, you must check it out for update. Note: The Check-in Unlocking flags can be viewed in Task Tracking Settings, described in Task Tracking Settings in the LANSA for i User Guide. Note: When the Task Tracking prefixes or the Checkin Unlocking flags are changed the system definition in Visual LANSA must be refreshed and the host monitor stopped and restarted.